I awoke early on my last full day on land. I had already determined that I would stay close to the resort and just spend time in the local area. I grabbed breakfast at the hotel lounge as per my custom now and I prepared for the day. 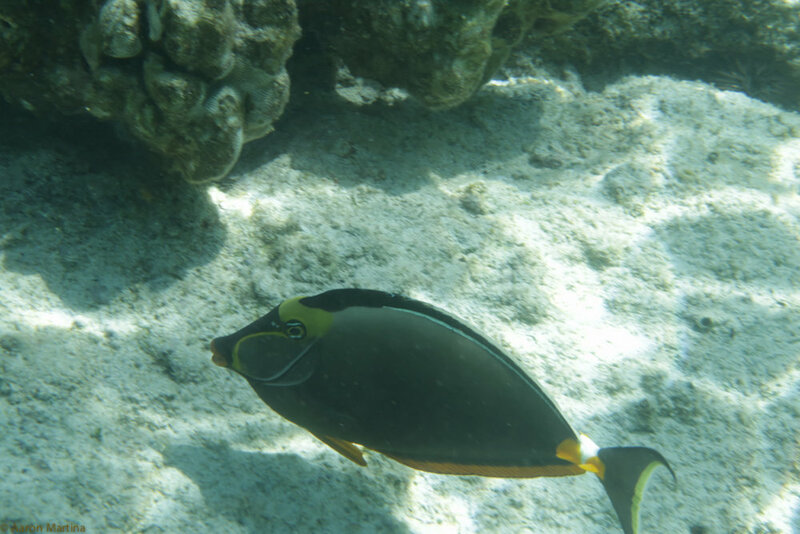 I decided that my main goal in the early day was to go snorkeling at a beach/bay that I had passed by often so I gathered my snorkeling gear and my new underwater camera and ventured out. I drove to Kahalu'u Beach, parked, and made my way to the beach area. 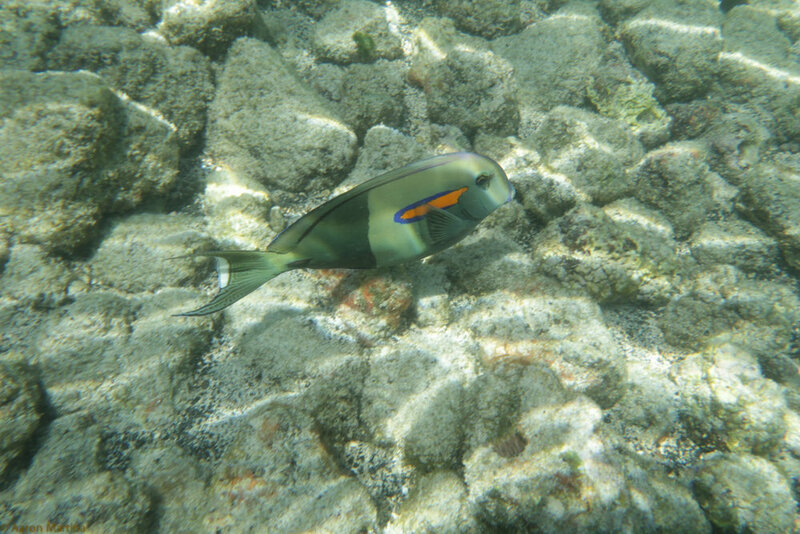 I stopped and talked with a volunteer ecologist, at least I think that was what they were, who advised me on the where to snorkel, how to enter the water as the rocks were VERY slippery, and what area of the reef to avoid as it was a severely low tide. 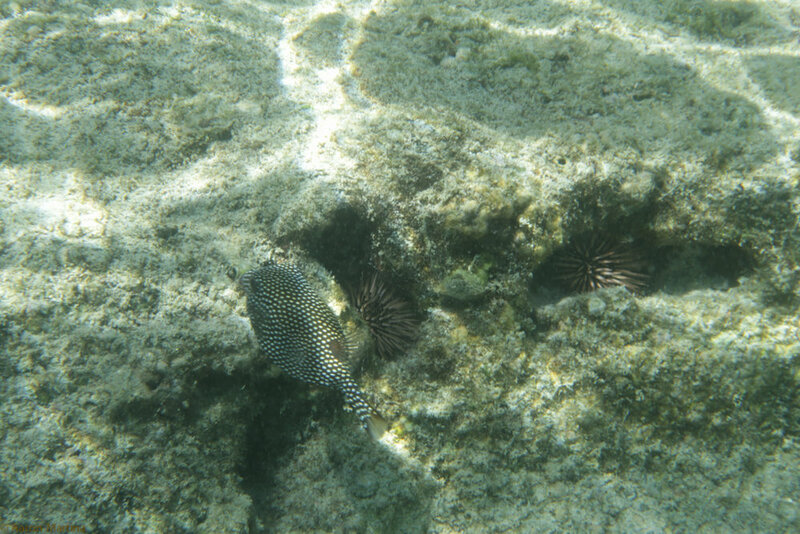 I donned my snorkeling gear and checked my new camera and its housing. 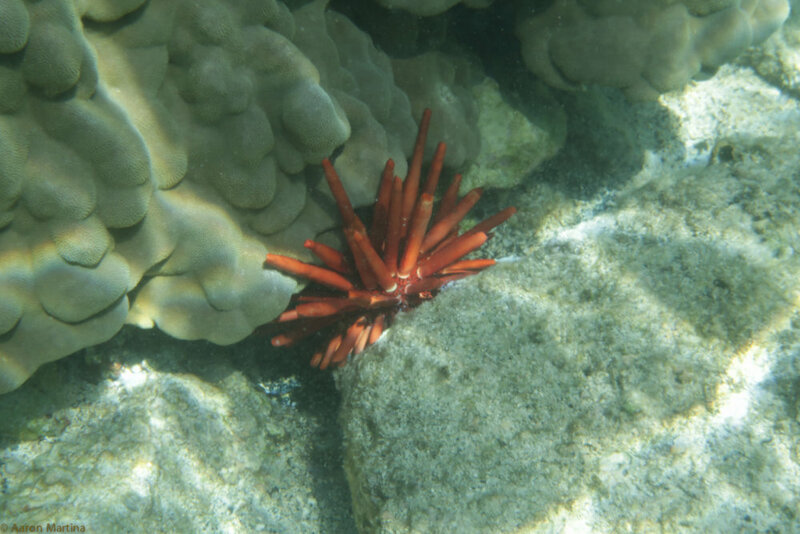 I cautiously traversed the rocky slope into the water and waded out into the sandy area where I put on my fins. And now I was officially swimming in the Pacific Ocean. 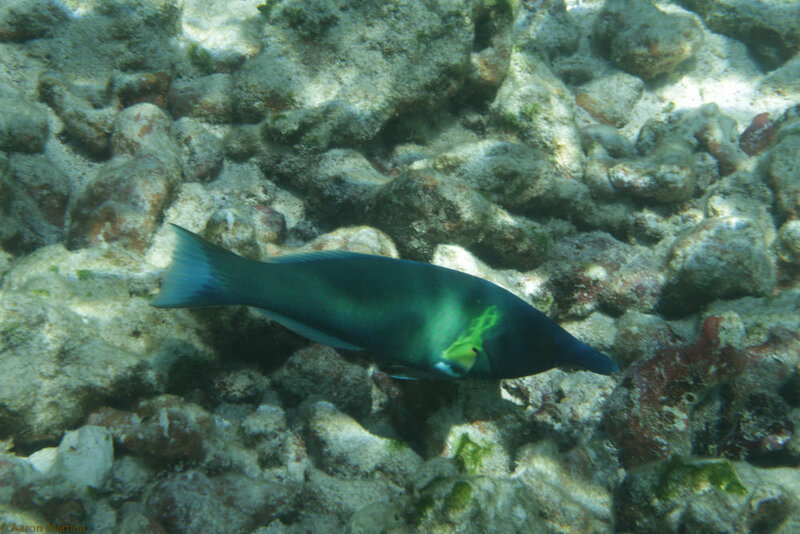 Immediately I was seeing tons of very colorful fish. Even with all of the human activity around the beach and rocks there were tons of wildlife. After exploring the reef I headed back in to shore. I dried off and then I went over to the ecologists to ask about some of the fish that I had encountered. They were a bit helpful but couldn’t find all of them. Oh well. I hung out for a bit just enjoying the sun and people watching. When hunger struck me I remembered that there was a place just down the street that I wanted to try. It was still a bit early for lunch but I had eaten breakfast quite early and I had worked up an appetite while snorkeling. I had had poke earlier in the week but this place was named Da Poke Shack so it had to be good. It wasn’t a shack but was a rather small establishment with very little seating. I believe I tried two different types of fish pokes and they were really good. I recommend it if you are in the area. After lunch I decided to visit some of the other beaches in the area to see if there was any more snorkeling to be had and I ended up at the Magic Sands Beach. After finding parking and making my way to the beach I set up my towel and just sunbathed/people watched for a bit. I went for a dip and swam around in the rather large waves for a short period. When I returned a woman nearby told me that she had had to move my stuff a bit as the surf was coming close to drenching my items. I thanked her and she responded in kind and then promptly put her earbuds back in as a sign that the conversation was over and not in a mean way. I can completely understand that sentiment. After getting my fill of sun, actually a bit too much, I returned to the hotel and got cleaned up and cleaned my gear. I proceeded to chill in my room watching tv and looking at the photos that I had taken on the trip so far. As the afternoon was changing into evening I decided that I would splurge for my last night on the island and hit a nearby restaurant, Sam Choy’s, that seemed to be a little bit higher end than average. Also, it had outdoor seating that allowed guests to watch the sunset. What I didn’t realize was how bright it would be or how much sun I had gotten earlier so when I was sat I made sure that I was facing away from the sun and it still was a bit too hot. The food was ok but definitely not worth the premium price in my opinion. When the sun was finally at the horizon I watched it until it dropped out of view. I settled up and back to the hotel. I was wiped so falling asleep to almost no effort. After a decent night of rest I awoke for my last day on land for the better part of a week. I had arranged a late checkout as I knew that I wouldn’t be able to board the Aggressor until the late afternoon. I hadn’t even packed and I was going to take a leisurely day to do some nearby exploration and maybe chill by the hotel pool. I ate for the final time at the hotel lounge and then chilled in my room for a bit. I then received a phone call from another diver who stated that I needed to get to the boat as soon as possible with all of my stuff as the boat had to leave dock due to large waves that were incoming and were going to make it dangerous for the boat to stay where it was. After a week of living in a hotel room I had to very hurriedly toss everything back into my bags, check out of the hotel, and race down to the dock. About forty minutes later when I reached the dock there seemed to be a canoe regatta going on and the entire dock was packed with people and vehicles. I chatted with the guard, for lack of a better word, manning the gate to the dock and I mentioned that I just needed to drop off some stuff with the Aggressor and then I would leave. He let me through and I was slow able to move my Jeep to a place close enough to the Aggressor that I could unload. I hailed someone on board and they let me drop off my bags although they hadn’t been as concerned as I was led to believe. With that done I had time to kill so I left the dock which was a huge challenge as nobody seemed to give way to a big white Jeep attempting to move through the crowd assembled for the regatta. I finally discharged and proceeded to leave the area. I decided that this would be a good time to return my rental car but I wanted to stop at a dive shop first to purchase a noisemaker. With that mission accomplished I filled up my Jeep with gas, returned it to National, and hailed a taxi to return me to the main Kailua-Kona village. 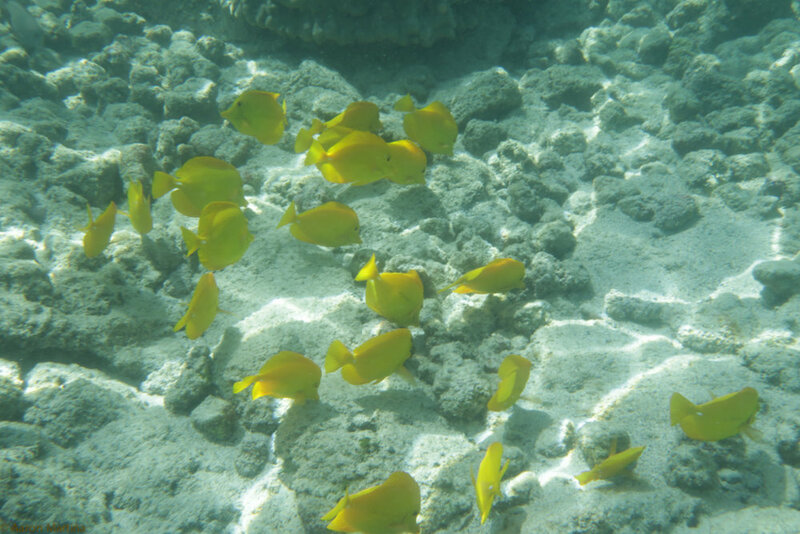 When I returned I stopped at the local post office in order to buy some stamps for post cards and then I walked over to the Kona Brewing Company to meet up with the majority of the Orlando Reef Divers (ORD) that were going to be on the boat. We ate lunch together and then people split up to go do different things in the area. I decided to go for one more walk along the seaside of town. I stopped at one park and watched the canoe regatta for a bit but I felt a bit uneasy with the other people in the park so I continued on down the road and ended up at a small shopping plaza. There was a shop that sold shaved ice so I purchased on with cherry, banana, and mango flavorings and then sat in on a shaded bench that had a view of the ocean where I could watch the waves and the regatta as well as keep an eye on the Aggressor that was just a bit offshore now (having left the dock before noon). I sat there for a long while enjoying the ocean and when I noticed the Aggressor heading back to dock I figured I would make my way back in that direction. I stopped at a convenience story for a Diet Coke and some post cards (I should have done this earlier as I had plenty of time). As I reached the dock I saw the follow members of ORD as they were preparing to board the boat when it finally docked. When the boat finally docked we met the captain and some of the crew and we boarded the vessel. We were given an introduction to the boat and the safety procedures and shown to our cabins. The boat was then launched and positioned just offshore where we met the entire crew and ate dinner. We then socialized for a bit before retiring to our cabins for the night.